This weblog contains of the lates archaeological news from Iran. Tehran, 25 January 2006 (CHN) -- The first catacomb belonging to the Islamic era, which was used as a safekeeping place for the dead, was discovered in Manjil during the excavations in the east bank of Sefidrud River in Gilan province. Most probably this catacomb dates back to the Ilkhanid era. Since the Parthian era, catacombs were built most often on the ways of caravans in Iran. These catacombs were used as a place for temporarily keeping of the dead. Whenever one of the members of a caravan died during the trip, his or her body would be “kept as a trust” in these catacombs and on their way back the caravan would pick it up to bury the body in a cemetery. The chilly weather of the catacombs, which were built inside the mountains, prevented the decay of the corpse. “This catacomb was discovered during excavations in the east bank of Sefidrud River which started recently to determine the route of Qazvin-Anzali railway. Some parts of this catacomb, which must have belonged to the Ilkhanid era, had already been unearthed during the illegal excavations, and the rest of it was dug up by the excavation team currently active on the site,” said Vali Jahani, an archeologist from the Cultural Heritage and Tourism Organization of Gilan province. “Big 3x1 or 3x1.5 meter stones, stuck together by mortar, were used in the construction of this catacomb. How such huge pieces of stones were dug from the mountain and transferred to this area is still a mystery to us. Today large capacity cranes are needed to lift such big stones. Most probably during the ancient times the stones were transferred to this area by several strong men,” added Jahani. The rectangular-shaped catacomb discovered in Manjil has one entrance. During the Parthian era, catacombs were called “cubbyhole graves”. 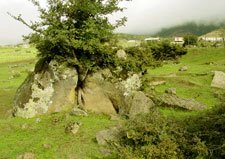 Today a large number of cubbyhole graves can be seen in different parts of Iran. Archeologists believe that there might still be more catacombs on the basin of Sefidrud River and are conducting more archeological excavations in order to find them.